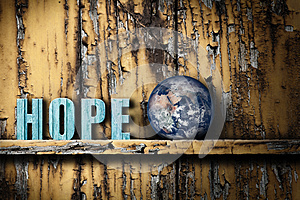 Word text hope and planet Earth on the shelf on worn wooden background. Concept of hope for the health of the planet or humanity in general. Contrast between the grunge background and significance of elements lying on the shelf.